Opera Parallèle paid tribute to the season last Saturday, Dec. 8, with a heartwarming performance and plenty of tinsel. 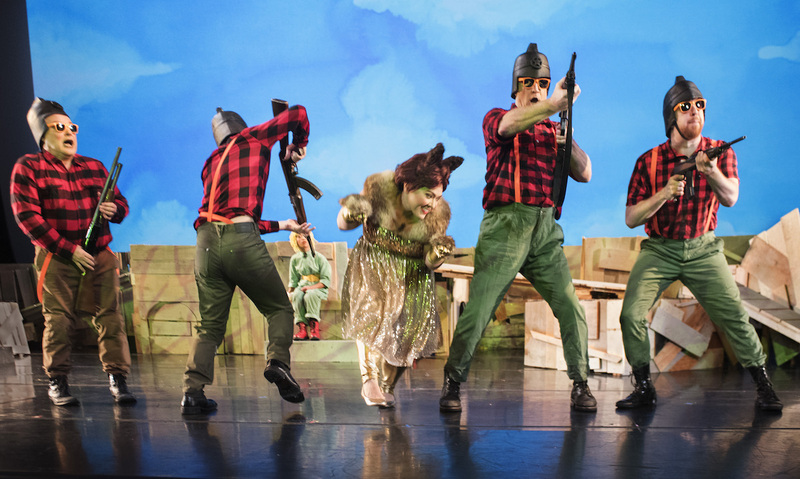 That was Rachel Portman’s opera adaptation of The Little Prince, an oft-republished story by Antoine de Saint-Exupery that uses the form of a children’s book to impart some ageless wisdoms. And the “tinsel” was a cast of top-notch voices and members of the San Francisco Girls Chorus who dressed in gold and silver with lights on their fingers and stars on their heads. Held in the Marine’s Memorial Theater on Sutter St, one would have been particularly ready for holiday magic-making on that Saturday afternoon, as the theater-goers had to thread their way between thousands of people who were dressing up as Santas in the streets. A relatively new holiday, “Santacon” was in full swing in San Francisco. Nice and naughty costumes were well balanced, with jolly white beards and red velvet bodices all creating a sense of impish good will. Amidst fires and daily fears, it was a relief to see people just out having fun. The matinee upstairs from this hubbub turned out to be heady in its own right, and the audience, many of whom were children, were spellbound. 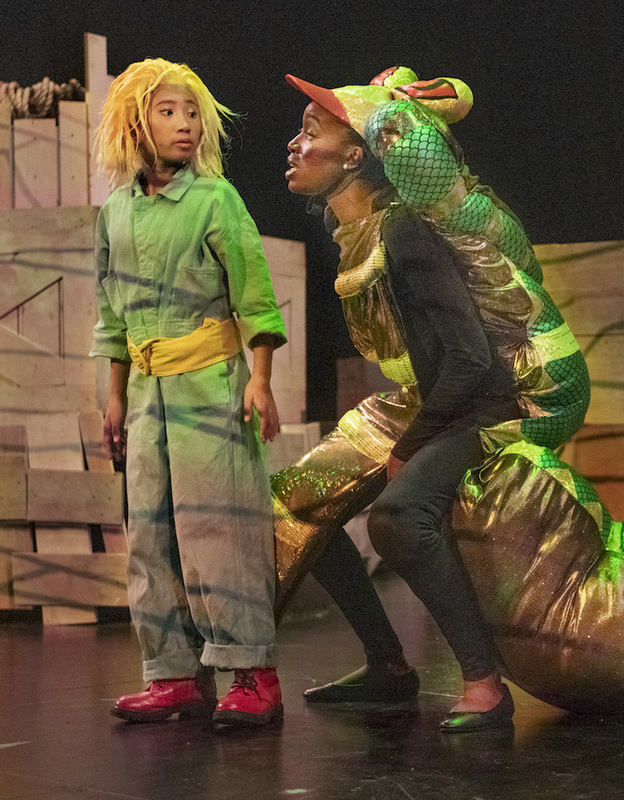 Erin Enriquez sang the part of the Little Prince, her young voice sweet and centered and carefully amplified to equal the heft of the adult voices of the other parts. She led two performances and shared the role with Sophia Stolte, who sang the other two performances. Sophia Stolte and members of SF Girls Chorus. Photo: Steve DiBartolomeo. 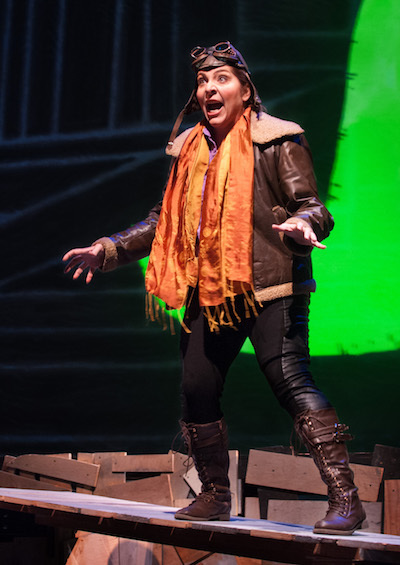 Opposite her was mezzo Eve Gigliotti in the part of The Pilot, cast cross-gender but just as effective – or more so. Her delivery had real warmth, resonating with the text which asks us to “see with the heart.” A gentle camaraderie between her and Enriquez suffused this production. Anchoring the lower end of the spectrum was bass-baritone Philip Skinner, a sought-after singer with a wide repertoire. I have heard him as a bone-chillingly evil Scarpia in Tosca and as a sorrowful Doctor in Vanessa, and perhaps that range helped him to quick-change from evil baobab to foolish monarch to hunter. But again, he was generous and careful here, and his touches of outsize acting entranced the young audience. He anchored some lovely harmonies with baritone Zachary Lenox (who also soloed as the Businessman) and tenors Samuel Faustine (the Lamplighter) and J. Raymond Peters (the Vain Man). Each of those excellent singers also happily inhabited their several roles. The musical score was a reduction from pit orchestra to piano and percussion, but that arrangement stretched into a surprisingly full language, with Keisuke Nakagoshi as pianist and Joel Davel on drums and snares and marimba. Nakagoshi, the resident pianist of the SF Conservatory of Music, created a wealth of textures, from watery trickles to thundering events, while Davel feathered that landscape with snare hisses and star-like twinkles. Artistic Director Nicole Paiment conducted the ensemble, with Brian Staufenbiel as Creative and Stage Director, an arrangement that has produced eight years of acclaimed productions for this married team. The sets by Dave Dunning were an assemblage of crates and planks, turning “set” back into process, and allowing the North Saharan desert to seep deeper in own imaginations. That and a backdrop of comic-book-bright illustrations by Matt Kish led us to a realm of fresh impressions, the land of the young. But this was no tale of holiday cheer. Saint-Exupery wrote what many children know – that “grown-up” values can injure the heart. That thirst is thirst, and night fears are real, and death is patient. Christabel Nunoo sang The Snake, a soprano with agile top notes and a tight vibrato, and offering a dangerous comradeship like Schubert’s gentlemanly Death. 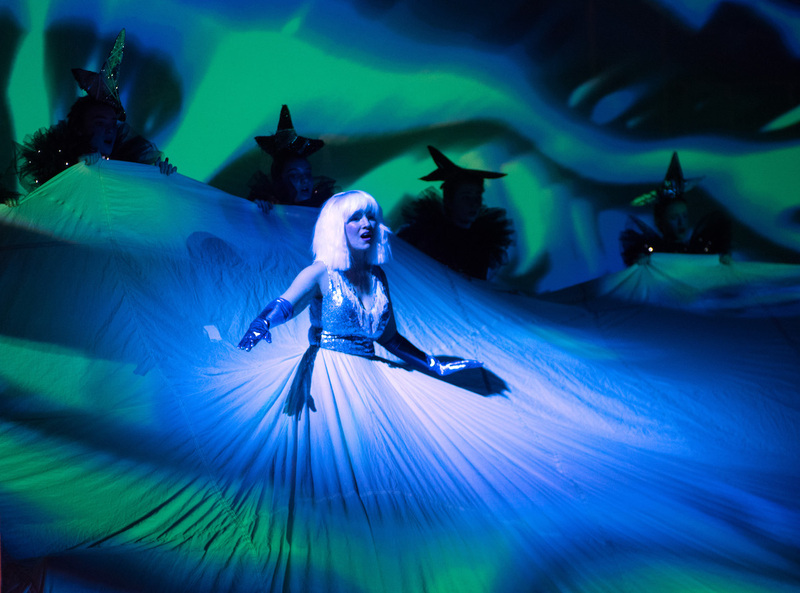 Maggie Finnegan completed that excellent cast with wordless arpeggios as she sang the role of The Water. She was surrounded by fourteen members of the Level IV Ensemble of the SF Girls Chorus, who tied the production together with the delicate harmonies of water sprites or stars or flocks of birds. At times the Chorus sang as they walked down the aisles, tying us in as well, and as the young turned and stared, one could see the “tinsel” of this season in their eyes. 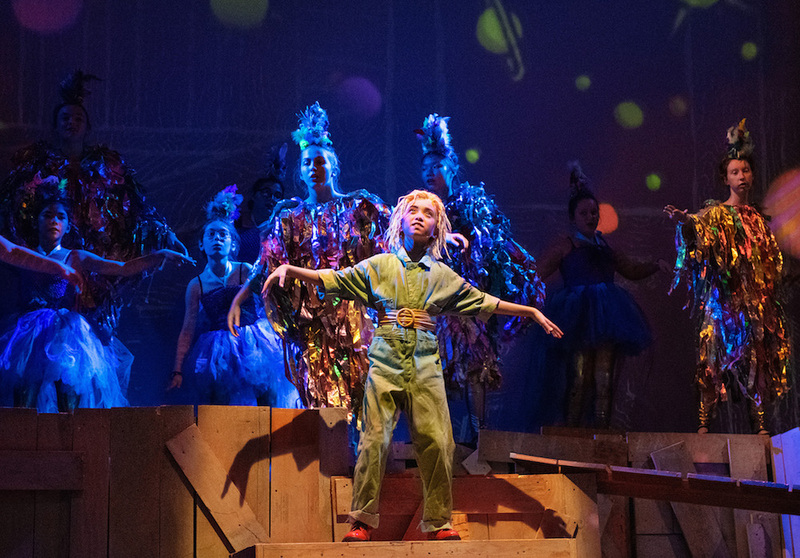 Photo top of Erin Esquivez as The Little Prince and Christabel Nunoo as The Snake; below, Sophia Stolte and members of the San Francisco Girls Chorus; Eve Gigliotti as The Pilot; Philip Skinner, Zachary Lenox, Samuel Faustine and J. Raymond Peters as Hunters; and Maggie Finnegan as The Water. All photos by Steve DiBartolomeo.